The physiology of koi carp is a fantastic topic; none more so than the subject of gas transfer. Once one gets involved in this kind of study, it soon becomes apparent that the fish are a miracle of design that have adapted to an environment (WATER) that is a real challenge for a living organism. Oxygen is the basis for most life forms to survive. We as human beings breathe in atmosphere that contains about 20% oxygen. Oxygen is relatively insoluble in water and as such fishes live in an environment that can typically carry a maximum O2 content about 30 times less than the atmosphere, this places the fish at a distinct disadvantage. But where as humans living in a relatively oxygen rich environment, we can only extract 20% of that available oxygen where as fish can extract 80%. Although fish excrete faeces they cannot afford the luxury of excreting uric acid as this would in the end acidify their environment and continually reduce the pH, and result in their down fall, so fish produce ammonia instead, which natural bacteria can detoxify for them and the action to deal with this, at least this requires no effort / energy on the part of the fish. Despite these obvious disadvantages, fish evolution has adapted and over come these obstacles to such an extent they can live in quite a range of aquatic conditions, from very high oxygen content of water typical found in streams and rivers, to ponds, lakes and swamps with poor oxygen saturation. Antarctic ice fish have adapted that well to low temperatures to such an extent that they no long have haemoglobin, the basic oxygen carrying molecule that is found in the blood of all animals and certainly essential for support of life as we know it. If we first consider oxygen transport around the body, there is in no way that enough oxygen can be held in simple solution in cool to warm water to support a fish’s life. So fish have evolved the physiology to cope with the low availability of oxygen in the surrounding water. The gas exchange apparatus is the gill. This organ has a very thin membrane only one cell thick to allow the blood to be in as close contact to the oxygenated water as possible. Oxygen crosses this membrane into the blood plasma by a process called diffusion. Diffusion is when a solute, in this case oxygen, migrates from an area of higher concentration to an area of lower concentration in an attempt to equalise the concentration/pressure. To visualize this, imagine a pond full of clear still water to which is very carefully added one cup of malachite green solution. Very soon it will start to spread out and continue until the whole of the pond is equally saturated with malachite green. This is the malachite green molecules diffusing to the lower concentrations, i.e., to the clear-water portions of the pond. Essentially this how oxygen moves across the gill membrane, i.e., the pond is the higher concentration and the plasma in the gill is the lower concentration. However as previously mentioned, the pond is saturated in oxygen to a maximum of around 11 ppm, dependant on temperatures. This concentration is not enough to sustain a fish so the fish has to do other things to increase this concentration and indeed as a couple of tricks up its sleeve to achieve this. Blood as we know it is just a transport media, pure and simple, it is responsible for the transport of Oxygen and Carbon Dioxide to and from the lungs or gills in the case of fish, to respiring tissue, this is caried in the haemoglobin and hydrogen-carbonate ions in the plasma. It further transports organic digestive products, I.E. Glucose Amino Acids and vitamins from the intestine to respiring tissue and liver, this time in the plasma. Mineral salts, I.E. Calcium, Iodine, Iron from the intestine to the bones, teeth, thyroid gland. Hormones, from the Pituitary gland to the liver, it even transports a certain amount of metabolic heat, less so in fish but more so in mammals, the list goes on but you can see when it comes down to basic's, it’s simply a transport media. Blood is made up of white blood cells (Leucocytes) these contain the bodies defence and immune system, they are ideally situated here to fight disease and antigens as they can reach any part of the body. ,(Erythrocytes), Red blood cells. (Platelets), these contain amongst other things clotting agents, a koi's blood is very high in clotting factor and clots extremely fast. Finally the Plasma, the clear transport fluid/media containing mineral salts hydrogen and carbonate ions, iodine, etc. However, the red blood cells Erythrocytes and Plasma, are what we are concerned with. The red blood cells, Erythrocytes, are the essential oxygen carrying agents. Blood arrives at the gill depleted of oxygen but carrying CO2, carbon dioxide and carbonic acid - the by-product of metabolism, ready to take on board a fresh supply of O2. As this newly arrived blood has little or no oxygen, the concentration of O2 is very low or nil and oxygen will diffuse to across the gill lamellae from the higher concentration in the pond to this low concentration in the blood plasma. However as previously mentioned a fully loaded state of equilibrium (oxygen in solution) can only achieve a maximum status of 10/11 ppm and that would not be enough for the fishes life support needs. If this saturation is the best the fish can achieve, the fish may as well have pond water flowing through its veins. However, floating in the blood plasma are red blood cells and these contain haemoglobin molecules. Each haemoglobin molecule is capably of chemically bonding with four oxygen molecules thus taking the oxygen out of the pressure equation of the plasma. This allows the plasma to diffuse yet more valuable oxygen. And, almost as fast as the oxygen diffusion takes place, the haemoglobin binds it. contained in this is the respiratory pigments, which are proteins. Contained within the red blood cells are haemoglobin molecules each of which is made up of four sub groups, or Haem group. Each of these sub groups contain polypeptides made up of around 140 amino acids and ferrous iron, the iron amongst other things, gives blood its red colour. If the haemoglobin molecules were just in suspension in the plasma they would be excreted, during ultra-filtration by the kidney, hence the reason why they are locked away inside the red blood cells, erythrocytes. It is the iron content that is responsible for attracting oxygen and binding with the oxygen, until time comes to release it into the tissue. The haemoglobin molecule contains no nucleus to maximize space, however containing no nucleus does have its draw backs, in so much as it shortens the life span of the molecule, typical human haemoglobin lasts for about 120 days there are only scientific indicators as to how long fish haemoglobin will last before being deselected and replaced by the spleen and kidney, this will to some extent depend upon toxins found in the water. This phenomena, explains why the blood is capable of holding and thus transporting 20 times more oxygen than water can hold in solution. If the blood could only saturate the plasma to the same levels that was held in simple solution in the pond water there would be no need for the complexities of haemoglobin. 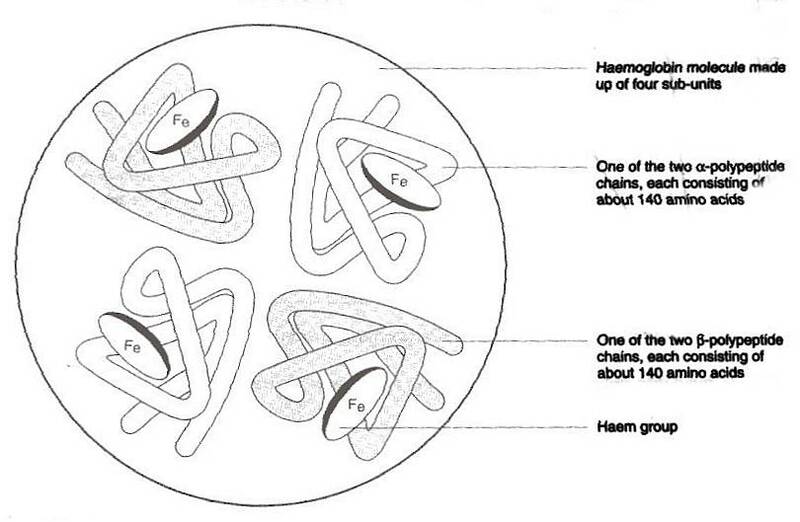 Haemoglobin is a simple but miraculous design. So the blood is fully loaded and starts off on its journey around the cardiovascular system to sites where it is needed, i.e., tissue sites around the body where the oxygen is all but depleted. Once it reaches such a site, there needs to be some kind of trigger to the haemoglobin to release the cargo (oxygen). This is achieved in the following process. The metabolic processes use up the available oxygen in the tissue. One of the results of this process is CO2. Carbon dioxide dissolves into the body fluids as carbonic acid, thus there is a lowering of the plasma pH in this area, where fresh Oxygen is needed. Usually the typical pH of the blood is around 7.8 ph and can be governed to an extent on how low you run your pond Ph, but at a tissue, site of much needed oxygen, the pH can drop by 0.5. It is this downward shift in pH that is the cue for the haemoglobin to drop off its cargo of oxygen and upload the carbon dioxide and hold on to it. At the same time, carbonic acid diffuses into the plasma and keeps the pH low on the blood’s journey back to the gills. Because the oxygen in the tissue is very low, once the haemoglobin releases the oxygen, this again causes oxygen to diffuse into the tissue from the higher concentration in the blood. Also because the blood arriving at the tissue has a low CO2 content, the CO2 diffuses into the plasma from the higher concentrations in the tissue. Of the respired CO2, 5 % is carried back to the gill dissolved into the blood plasma, a further 10% of the CO2 is held by the haemoglobin, attaching to the amino groups contained within the haemoglobin molecule. Once back at the gill, the carbon dioxide/carbonic acid diffuses across the gill into the pond water thus raising the pH of the blood. This clues the haemoglobin to increase its uptake of oxygen and whole process begins again. If however upon arrival at the gill, the blood is met with a low pond pH, there will be a micro environment around the gill lamellae that is even lower in pH due to the CO2 (converting to carbonic acid) being released at the gill, the net effect of which is that the haemoglobin will lose affinity for oxygen and tend to hang on to the CO2. This condition is termed “acidosis.” If the condition becomes chronic, compensation by the fish usually takes the form of an increase in haemoglobin. This is an over simplified view but in essence this sums the process up.